Children will always be children, meaning that they play with whatever is available to them. 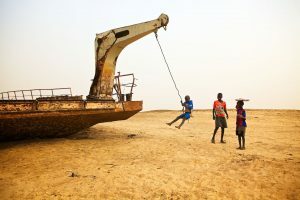 In this case, a busted ferry boat stranded on the sandy banks of the Niger river with a dangling piece of chain was enough to make a swing. They were having a good time.